What happens when you need to bulk change a lot of records on the database? The unwary novice might be tempted to load data from the database into class instances, change them and then either rely on change tracking to eventually make the changes persistent or even worse, explicitly do an update on every possibly changed entity. The non-novice readers should now rolling their eyes. It so happens that NHibernate offers a great alternative in the form of executable HQL. Basically, it is HQL for doing bulk changes: inserts, updates and deletes. Does not update version properties. Noticed the versioned keyword? This tells NHibernate to do the right thing: update the version on each affected entity, of the entity is versioned. The only problem with this is that it does not cascade. You need to find another solution. A final word on this: you can, of course, specify parameters in your queries, like in the following example. A minha apresentação sobre Entity Framework 7 feita na 6ª reunião presencial da Netponto em Coimbra está disponível aqui. Brevemente o video e a apresentação estarão disponíveis no site da Netponto. Obrigado a todos os que estiveram presentes! The NHibernate ISession is not thread-safe, that is, it shouldn’t be shared by multiple threads. The ISessionFactory, however, is thread-safe, and thus it should be used to create ISession instances as needed. Do not worry, creating sessions does not mean that connections to the database are immediately open and kept alive, the ISession implementation only opens database connections when they are necessary and closes them when they cease to be. Statistics can help us diagnose, for example, second level or query cache issues. An advice: do switch it off while on production, it does have an effect on performance. 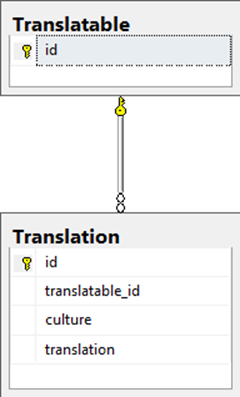 NHibernate, unlike others, has lots of ways to map columns from the database to and from classes. Normally, there is a 1:1 relation between columns and properties, but it doesn’t have to be so: there are, for example, components and dynamic components. This time we will be looking at dynamic components. Dynamic components allow the usage of a dictionary, where one or several columns from the database will be stored, each in its own entry. This is pretty cool, if we need to add more columns at some point, and we do not want, or can, change the class! Yes, it will be possible to use generic dictionaries (IDictionary<TKey, TValue>), when pull request for NH-3670 is merged, which should happen soon (NHibernate 4.1). I am setting the template for whatever will be stored in the Data dictionary, in this case, an integer column (A) and a string one (B) as an anonymous object. In NHibernate 4.1, it will be possible to use a dictionary instead (see NH-3704), which will help in making it more dynamic. In the third parameter to Component, we can change the mapping, for example, the physical properties of each column; we can even use ManyToOne instead of Property, so that a particular entry in the dictionary will point to another entity! With NHibernate you can have entity properties that are the result of a SQL expression (unlike other O/RMs). It is also possible to add arbitrary SQL restrictions to collections of an entity. NHibernate is clever enough to find out that the un-prefixed Id refers to the entity’s table. This is a silly example, but I think you get the picture. Remember that this is plain SQL, not HQL, and will not be translated in any way. Notice that I am mapping the RecentIssues collection as IEnumerable<T>, this is because otherwise I would have to check if the values being added matched the desired constraint (“>= GETDATE() – 7”, the last 7 days). Certainly possible, but I leave it as an exercise to you, dear reader! Of course, GETDATE() is a SQL Server function, the restrictions can only be specified in native SQL. Because filters offer everything that static restrictions do and more, we’ll focus on filters. A filter can specify a restriction, in terms of a SQL clause, to either an entity as a whole (the class, not a specific query) or to a collection (bag, set, list, map, array, etc). We would like to apply a restriction to the Translations property of Translatable, so as to filter the translations by the current culture. 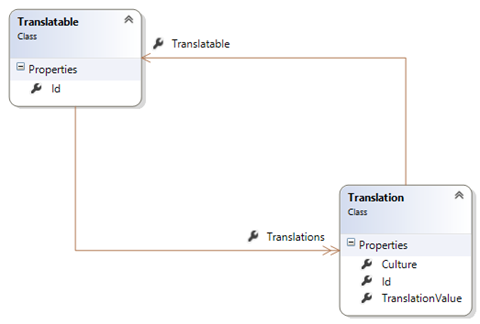 Now, whenever the Translations collection is retrieved, either through a SELECT or an INNER JOIN, the “Culture = :Culture” restriction – where, of course, :Culture is replaced by the current parameter value – will be applied automatically, together with the foreign key restriction. Did you know that NHibernate, like other O/RMs out there, allows you to map classes by convention? Yes, it’s true… Let me show you how! That’s all it takes! Really! This tells the mapper to use the high-low strategy for all entities. Yes… Entity Framework let’s you do this… kind of… only for some functions! As Paulo Morgado (@paulomorgado) pointed out, line “propertyName.ToUpper().Contains(value.ToUpper())” should really be “propertyName.IndexOf(value, StringComparison.IgnoreCase)“, because it avoids string allocations and in general is much better. This isn’t exactly a feature of NHibernate, but it is something that you can do with it and most people isn’t aware of. If you have a big number of classes and mappings in your domain, adding all of them to a Configuration instance can take some time. NHibernate allows you to serialize the Configuration instance with all the mappings that it contains so that you can deserialize it later, which can result in reduced startup time. The disadvantage is that if you change any of the mappings, you have to discard the serialized file and build a new one.